The Top Offense Charged will list only one offense. That does not mean it is the only crime you will face when appearing in court. 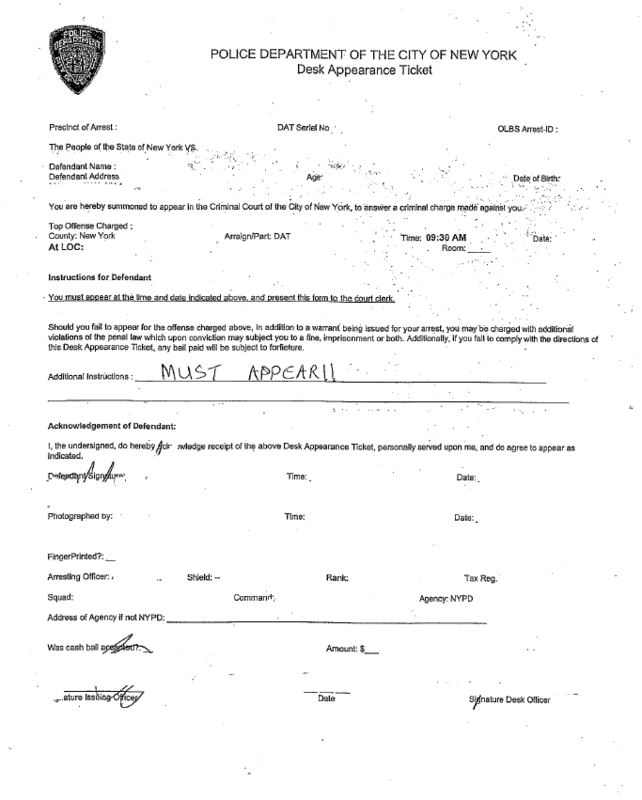 For example, with regularity a shoplifting arrest in New York City will reflect only a charge of PL 165.40 or PL 155.25, but when the District Attorney drafts your case, the complaint will reflect both crimes. In fact, the District Attorney can charge something completely different. In this scenario, if you are charged with a misdemeanor, but it turns out the value of the property exceeded $1,000.00, then despite what your DAT reads as Top Offense Charged, prosecutors could charge Grand Larceny such as PL 155.30. Similarly, if you are arrested and charged for possessing a drug such as cocaine, heroin, Molly or MDMA, you would likely have a top criminal charge of PL 220.03. However, if you also had a pipe, scale or other paraphernalia, you could also face the crime of PL 220.50. At LOC is the particular location where you must appear in court. Know that some counties have multiple criminal courts. For example, Manhattan has its “main” criminal court at 100 Centre Street and the “smaller” Midtown Community Court at 314 West 54th Street. The balance of the information contained on the DAT, other than the date and time of the arraignment, is more administrative. Again, if you lost the appearance ticket you would still appear and be arraigned by the court. If you lose it and fail to show, or merely do not appear for any other reason, the court will issue a warrant for your arrest. In the event that you are unable to appear because you live outside New York State or the USA, will be away for college or work, or there is some other compelling issue, your attorney may be able to appear by affidavit. Potentially, the case can also be resolved in your absence depending on the nature of the criminal charges. 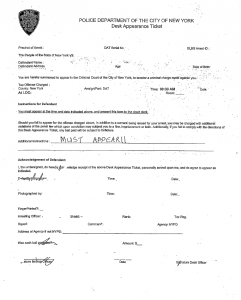 Whether you are issued a Desk Appearance Ticket in NYC or you are held in one of the various courts to see a judge, there is no difference in terms of your criminal charge and an impact upon conviction. Simply, be smart and aware. Take a moment to educate yourself on the offense charged and other crimes you may face. Armed with the proper information and counsel you can then put yourself in the best position to avoid what was a costly mistake or misunderstanding from becoming a life altering and career jarring ongoing criminal matter. Crotty Saland PC is a New York criminal defense firm established by two former Manhattan prosecutors. Crotty Saland PC’s New York criminal lawyers represent clients in all DAT arrests and cases throughout New York City.